A new student organization center will be opening on the fourth floor of Thomas J. Meskill Law Library in room 413. The new space, which formerly housed UConn Law’s microfiche and microfilm collections, will now be used as a workspace for all student organizations on campus. “The student organizations space came into being because we did not have space on campus to provide each student organization with an office,” said Jocelyn Kennedy, the Director for Library Services. “The idea is that this is going to be a collaborative space,” said Jennifer Cerny, Assistant Director of Student Services. Cerny, who spearheaded the project, started by polling student leaders last spring and asking them what they wanted in the space. The room is now made up of two round, boardroom-style tables, a lounge area, and a few desks. The back wall of the room is decorated with original student art, faculty photos, and there is a plan to hang up framed UConn Law t-shirts from years past. Upon entering the room, students will see a wood-carved sign made by Gary Mackiewicz, a facilities staff member, engraved with golden letters reading “UConn School of Law, Student Organization Center.” “It gives the feeling of a sort of college newspaper room,” said Cerny. “The room is designed with round tables, which I feel is an excellent mode of fostering informal and open dialogue during student group meetings,” said Sarah Polio, the Chief Administrative Officer for the Student Bar Association. “One ambition for this space is to facilitate collaboration and a sharing of ideas between student groups. The room is, in part, designed to encourage inter-group discussions and partnerships for the programming of campus events,” Polio continued. Cerny hopes that the room will attract more students to join an organization. “The idea is to have students look in through [the student lounge in room 418] and say ‘that looks cool, maybe I’ll join an org.,’” said Cerny. 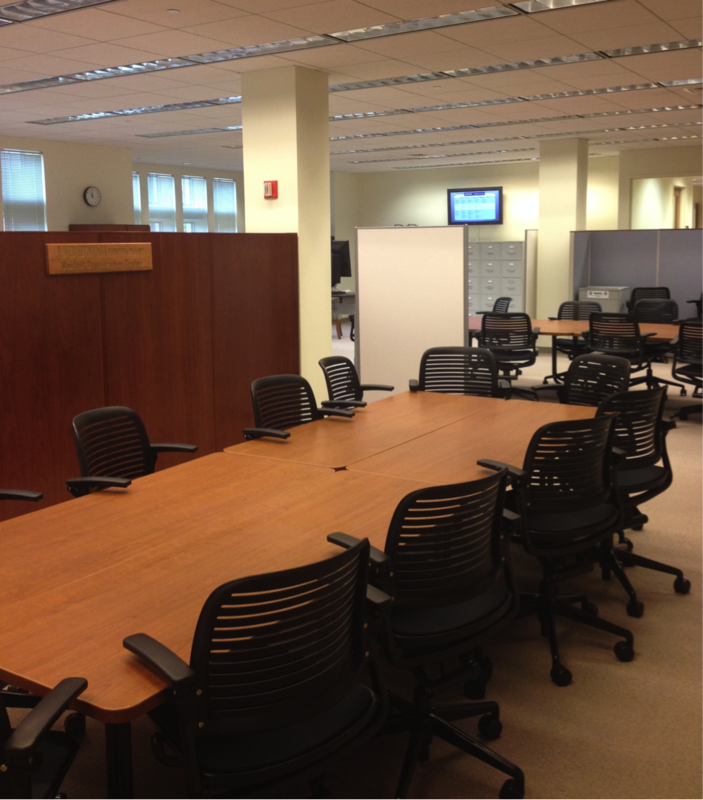 Putting the room together was a collaborative effort from the Law School’s different departments. “I.T. was a huge help and super generous in their donations,” Cerny said, pointing out the three LCD televisions that hang on the room’s wall and two movable computer stations equipped with cameras “so a member of an organization, or a guest speaker, can Skype into meetings,” Cerny added. Executive members of student organizations will have key access to the area and will be able to use the room at their leisure. “This space is really for all of the student organizations to meet and to work collaboratively, particularly as they work to plan events, symposium and other activities on campus,” said Kennedy. Student Services will be inviting members of organizations, faculty advisors, and alumni to tour the new space on October 9th from 5:30 p.m. to 6:30 p.m.
UConn Law’s Corporate and Securities Law Society (CSLS), a student organization devoted to the practice of business and corporate law, promotes opportunities for students to learn about the field and speak with legal professionals. The group has several events planned for the academic year, all of which are designed to get students more comfortable with networking and gain a better picture of what it means to practice in a complex and prevalent area of law. CSLS’s first event of the fall semester will feature Attorney Mary-Ellen Devlin, the Executive Director of Intellectual Property at Boehringer Ingelheim Corporation. Attorney Devlin will be sharing her experiences working as in-house counsel within the pharmaceutical/IP industry in an intimate lunch-and-learn format. CSLS also plans to sponsor a similar event in the spring that will host one of UConn Law’s newest faculty members, Professor Jeremy McClane. The organization’s flagship event, “Corporate Raw,” is held annually in the spring and invites a panel of corporate attorneys and professionals to discuss their experiences with students and answer questions. The word “Raw” in the title connotes that sushi is traditionally served at the event (indeed, the event is so popular that UConn Law’s Student Bar Association felt compelled to adopt express budget guidelines regarding the reimbursement of raw foods in response to it). Why sushi was chosen to be the hallmark is a mystery hidden within the legislative history of CSLS founders. However, what is certain is that Corporate Raw is an informative and worthwhile event that all members of the UConn Law community are encouraged to attend. For more information on CSLS and how to join, contact Ashley Membrino at ashley.membrino@uconn.edu. You can also subscribe to their TWEN page. Keep an eye out for community emails. On November 7th and 8th, UConn Law will be hosting the American Bar Association (ABA) Law Student Division Negotiation Competition for Region 1. Approximately 24 teams and 100 students will gather at the Law School, with participants coming from the Eastern United States and Canada. The competition “simulates legal negotiations in which law students, acting as lawyers, negotiate a series of legal problems” with the simulations “consist[ing] of a common set of facts known by all participants and confidential information known only to the participants representing a particular side,” according to the ABA website. The winning team will advance to the ABA National Negotiation Finals Competition in Houston, Texas. The topic for the Competition is torts. The Region 1 Negotiation Competition will take place over two days. On Friday, each team will participate in two, 50-minute qualifying rounds. The qualifying rounds will end with each team reflecting and then presenting 10 minutes of self-analysis to the judges before receiving feedback and scoring. Friday night there will be a reception to allow the teams to socialize outside of the competition setting. The top four teams in the qualifying rounds will advance to the final round on Saturday morning, which will also be composed of two, 50-minute rounds with self-analysis. Teams are scored on seven criteria: negotiation planning, flexibility in deviating from plans or adapting strategy, outcome of the session, teamwork, relationship between the negotiating teams, self-analysis, and negotiating ethics. Professor Jessica Rubin heads the Law School’s efforts in organizing the Negotiation Competition. Rubin submitted a proposal to the ABA that detailed why UConn Law should host the Region 1 competition and was selected. Also involved in organizing the event are staff members from the IT Department, the Library, Special Events, the Dean’s office, and Dean Timothy Fisher. UConn Law is a unique host for this competition with respect to the composition and preparation of the judges. All but five of the participating 40 judges are practicing, experienced lawyers or law school professors. Their experience ranges from criminal to civil, with transactional attorneys and litigators, and both the public and the private sector will be represented. Over half of the judges will be UConn Law alumni. As for the five judges who are not lawyers, each of them negotiates or mediates as part of their career. “If someone is not a lawyer, then their job involves negotiation,” commented Rubin. Students will be judged by panels of three, and two of the judges on the panel must be lawyers. There will be stringent conflict checks to ensure fairness of judging. Before the start of the morning and afternoon rounds on Friday, and on Saturday morning, all of the participants will gather to meet the judges. This ensures that students and judges do not know one another by either name or visual sight. If there is a conflict, the Negotiation Competition organizers will ensure that the students compete before a different panel of judges. In addition, no judge with UConn Law connections – other than being a graduate of the Law School – will judge one of the UConn Law teams. One of the interesting ABA rules is that students are not allowed to reveal what team they represent to the judges. “The greatest thing about running this event has been reaching out to former students and reaching out to people in the negotiating and mediating community and getting them excited to help our students,” said Rubin. Further, all of the Negotiation Competition judges were sent the problem materials and guidelines for judging well in advance in order to best prepare. In this way, all feedback given to students will be well informed both by preparation and experience. Other negotiation competitions have had student judges, recent graduates as judges, or judges who are not prepared more than a day in advance. Rubin commented that she worked to select judges who are effective teachers. The final rounds will be judged by a panel of four professionals consisting of: an academic, a Connecticut practitioner with a focus on criminal litigation, a Connecticut practitioner with a focus on corporate transactional work, and a Connecticut practitioner with a focus on mediation. UConn Law is sending three teams of second and third year students. Team members include: Benjamin Schimelman, Kevin Matyger, Aaron Baral, Alex Cox, Pamela Bass, Malcolm Ranger-Murdock, Joshua Thompson*, Christopher Stanton*, Sarah Polio*, and Spencer Hill*. Names marked by an asterisk indicate alternates. UConn Law’s student coaches include: Thomas Holmgren, Connor Simpson, and Spencer Hill. Rubin noted that she chose UConn Law’s teams based on past competition performance, performance in UConn Law’s First Annual Intramural Negotiation Competition, and student interest. Six of the competitors first competed in the Law School’s intramural negotiation competition in September. Third year student Pamela Bass is coordinating the UConn Law teams in her role as President of the Negotiation & Dispute Resolution Society (the Society). According to Bass, UConn Law teams are preparing for the Negotiation Competition by engaging in a series of sparring sessions against members of the Society. No students outside of the main competitors have the confidential team information so sparring partners are creating their own facts to go off of. “The more creative they can make issues, the more the team has to think and be nimble going into [the Negotiation Competition],” explains Bass. This creativity helps to simulate the actual competition, where UConn Law team members will not have information confidential to the opposing team. Interested students are encouraged to view the Final Rounds of the Negotiation Competition on Saturday, November 8th. All rounds are open to the public and will take place in the Law Library. Looking forward, Professor Rubin is collaborating with a faculty member at UConn’s School of Business to organize and host a negotiation competition in the spring that will be open to both law and business students. When I was a kid, I had nightmares every night. Most of them were pretty typical: serial killers, demons, clowns…. Due to a particularly troubling episode of Square One TV, I couldn’t have an alarm clock in my room for like three years. I was convinced every clock was actually a bomb set to go off at exactly 3:12am. And I refused to stretch my feet to the end of the bed because I was absolutely sure scorpions would sting them. You know, since scorpions typically live in little girls’ beds. (Thank you Dad for letting me watch The Arrival at the age of seven). Needless to say, I wasn’t the smartest kid. As I got older, my dreams evolved. In my teens, they mostly involved aggressive acne and having dog food poured down my back while slow-dancing at Prom. (Thank you Leelee Sobieski). I don’t think I dreamt at all in my early twenties. If I did, I don’t remember them. Then again, I don’t remember much of my waking hours either. The only think that my twenty-year old self feared was reaching the bottom of a bottle of Hendricks. Okay, who am I kidding? I couldn’t afford Hendricks. Law school brought the nightmares back. At first, I dreamt of cold calls and “the Hairy Hand” – obviously. Then, the dreams became a little less predictable and a bit more depressing. Now when I close my eyes at night, I see “id.’s” with unitalicized periods and n-dashes where there should be m-dashes. It’s terrifying. The other night I woke up screaming because I dreamt that I’d forgotten to sign a cover letter. And I keep having this recurring nightmare that my Linkedin account has been hacked and now everyone thinks I’m a preschool teacher from Poughkeepsie, who eats kale chips and thinks “amicus curaie” is a venereal disease. I can’t wait until I can afford Hendricks. On Friday, November 7, 2014, the Public Interest Law Group (PILG) will host the 22nd Annual PILG Auction. The event expects to bring over 300 attendees including students, professors, alumni, practicing lawyers, and judges, according to PILG Auction Chairs Arielle Sharma, Shruthi Reddy, and Daniel Spruill. The theme for the auction is casino night and offers free attendance, dinner catered by Vito’s by the Park, and a cash bar. Over 150 items will be auctioned off including big-ticket items such as vacation packages, sports memorabilia, and BARBRI review courses, as well as smaller gifts including restaurant gift cards and gym memberships, with some items starting as low as one dollar. “This is a fun, nice break to see people, dress up a bit, but still have a casual night. There are some really good deals,” said Sharma. There will be both a live and a silent auction. The Auction Chairs encourage attendees to view auction items as gifts for the upcoming holiday season and even for significant others, such as an anniversary package that includes a wine tasting. Vacation packages include flight vouchers for trips to Antigua, Barbados, St. Lucia, and more. The Auction Chairs are suggesting that students pool money together with friends as some of the trips are for up to six people, offering a significant discount. “A lot of the professors have been really generous in donating,” said Sharma. Auction items from professors include white water rafting trips with Professor Cohen and Professor Rubin, dinner for four with Professor Fischl, and brunch with Professor Morawetz. “Some of the items provide a great way to get to know professors outside of the classroom and in a fun setting,” said Sharma. The event is also a helpful networking tool, according to Spruill, with Judge Joan Alexander auctioning a golf session and Probate Judge Evelyn Daly auctioning lunch with her at the Farmington Country Club. “The PILG Auction is the one social event that brings together people from all constituencies on campus as well as alumni, and members of the local community,” said Assistant Dean of Students Karen DeMeola. Unlike traditional law school events, according to DeMeola, the Auction allows attendees to interact informally, recounting bidding wars between students and colleagues alike. “People laugh at themselves and each other and everyone gets into the winning spirit,” said DeMeola. Proceeds from the auction benefit the PILG Endowment Fund, which funds summer fellowships for UConn Law students serving in unpaid public interest law positions. “Last year the Foundation offered fourteen fellowships for $4,000 each,” said Spruill. According to Spruill, the fellowship amounts offered to students depend partly on the success of the auction. Among last year’s recipients were students working for the Massachusetts Commission Against Discrimination (MCAD), Commission for Human Rights and Opportunities (CHRO), Office of Child Advocate, Human Rights First, The Children’s Law Center of New York, and the Legal Aid of East Tennessee. Last year, one of the fellowships was awarded to 2L Zachary Alexander who worked at the ACLU’s Racial Justice Program. “Without the PILG fellowship, I would have been unable to live in New York and gain such valuable connections while fighting to preserve the constitutional rights of minorities,” recounted Alexander. The Public Interest Law Journal and other UConn Law students will be volunteering at the event. PILG continues to accept volunteers and donations until the day of the event. To contact the Auction, email pilg@gmail.com. The PILG Auction will take place in the Starr Reading Room and will begin at 6pm. Accepted forms of payment include cash, check, Visa, MasterCard, and American Express.